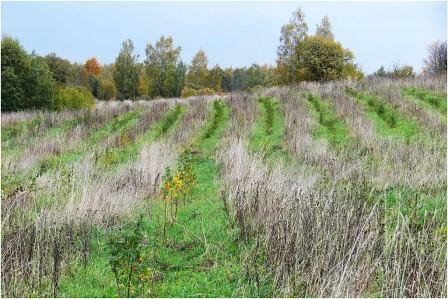 A 50 ha plot of land was identified in Zilupes District by a commercial forest company for planting. The land had not been farmed for a long time and the owners wanted to find a way of getting some economic return from this land. The objective is to create a productive mixed forest stand of 25 thousand silver birch (Betula pendula) and 94 thousand Norway spruce (Picea abies) trees, to increase economical value of land. This new timber resource will help reduce future commercial pressures on forests with high conservation value. When the project started in 2010 the first job was to cut the overgrow bushes that had colonised the land since it was last farmed, then plough the soil and plant the young trees. Since then the grass has been cut regularly (for some areas twice in the season) to prevent it growing over the young trees and weakening or killing them. RDP funds were spent on preparation of an afforestation plan, buying the 121 000 young trees, and the work on the site described here. The main benefit has already been achieved, because this land is once more in productive use after being abandoned. Its new role will provide not just a future income but also environmental and social benefits.The forest is still young, but is already helping to store carbon in the trees and soils, and in future will produce high quality wood from native trees (without using the chemicals that are common in agricultural production). The plan for mixed planting was prepared before work began to clear the overgrown vegetation and prepare the soil. After that had been done it was easier to identify which areas and soils were most suitable for the two different species of trees, but it was too late to change the planting plan. So for another scheme like this it would be better to wait until after ploughing to work out the mixed species planting.